A RAR file is an archive created by WinRAR application. The RAR file is a data container which holds one or multiple files and folders. 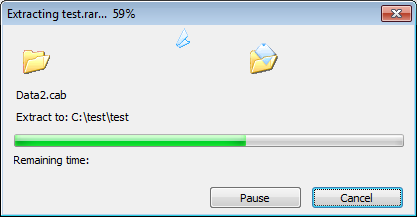 RAR file uses its proprietary compression algorithm to compress data in it. When compressing large file sets, the RAR file can be split into multiple parts. It can also be encrypted with a password to protect important files. 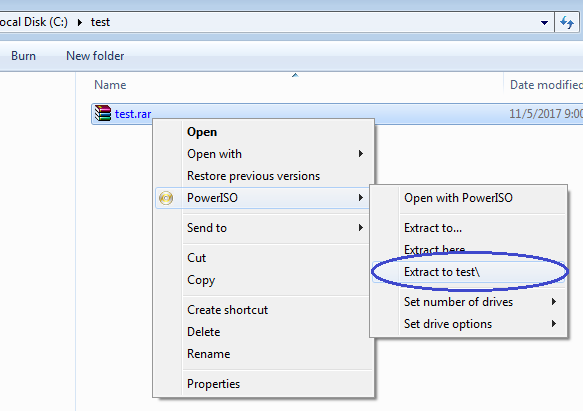 With PowerISO, you can extract RAR file by a simple click. Open "My Computer" and select the rar file which you want to extract. Right-click on the file selected, the shell context menu will popup. Select the menu item, "Extract to <folder name>. The folder name is just the rar file name. The rar extractor will start to run. It will automatically create a folder using the file name, and extract all files in the rar file to this folder. If the rar file is encrypted, PowerISO will prompt you to enter the password. After the operation completes, you can access the extracted files in destination folder.